STRASBOURG, France (CNN) -- America's NATO allies in Afghanistan are committing 5,000 more troops to the fight against the Taliban, White House spokesman Robert Gibbs said Saturday. 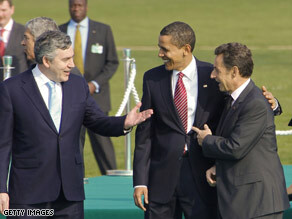 British Prime Minister Gordon Brown, President Obama, French President Nicolas Sarkozy Saturday in France. Around 3,000 forces from allied and partner nations will provide security leading up to Afghan elections later this year. Of the 3,000, the major contributors will be Britain, with 900, and Germany and Spain, with 600 each. About 1,400 to 2,000 soldiers will be deployed for 70 embedded training teams needed to help build up the Afghan National Army to a size of 134,000. A training team would include 20 to 40 soldiers who provide mentoring to Afghan soldiers in the fields. Eleven countries are contributing to these teams. More than 400 new paramilitary trainers and mentors will be training Afghan National Police, NATO's first commitment to Afghan police training. Of those, 300 will be French and 100 will be Italian. NATO countries met in Europe on Friday and Saturday to talk about its war against the Taliban and al Qaeda in Afghanistan and Pakistan. This comes as NATO's Supreme Allied Command asked for 20,000 additional troops to aid security ahead of the elections. President Barack Obama has ordered the deployment of 17,000 troops to fight the Taliban in the south and the east and 4,000 more to train Afghan troops. NATO also backed expanding the NATO Afghan National Army Trust Fund to include sustainment costs for an expanded Afghan National Army. NATO is committing $100 million to the fund.